This gay-only cruise is a perfect way to enjoy the sun and sand of Puerto Vallarta. Pick-up is straight from Los Muertos beach, walking distance from the blue chairs, in the Romantic Zone. 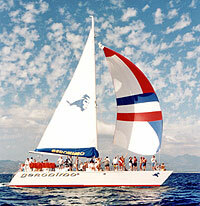 We'll set sail and soak up the rays aboard the twin-hulled catamaran Geronimo. Keep an eye out for manta rays, dolphins or whales (in season) along the way, as we make our way to the Marietas Islands marine preserve. Here we'll snorkel in the marine park for an hour, then we have another hour to relax on the beach and swim. After snorkeling, the music comes on, and you'll have a blast all the way back to Puerto Vallarta. This is a PRIVATE CHARTER so only your group will be on the boat with the crew. Note: This is intended to be a gay-only cruise. Everyone is welcome, of course, but if you're not gay, you may wish to check out the Geronimo Marietas Islands tour instead. Food and Unlimited Open Bar are Available Upon Request. Contact Us for a Quote. Alternate Itineraries are Available, Just Ask! Straight? No problem, you can still charter it. Departs From: Los Muertos Beach in Puerto Vallarta. Directions will be provided with your confirmation. Temporarily out of the water for maintenance. We expect this tour to be available again shortly.